In the sixth book in Stephan Pastis's New York Times bestselling series, Timmy is being threatened and must rely on his new partner to solve the mystery – and possibly save his life! 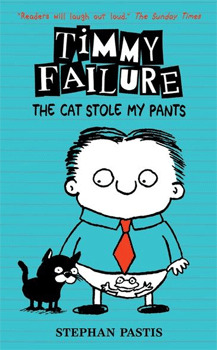 Everyone's favourite best worst detective is back in Timmy Failure: The Cat Stole My Pants, the sixth book in the bestselling series that's perfect for fans of Wimpy Kid and Tom Gates. Timmy is in Key West, Florida, ostensibly for the honeymoon of his mother and Doorman Dave – if they even got married, which Timmy doubts. Unfortunately for Timmy, crime doesn't take a holiday. And because Total has fled to Cuba, Timmy must rely on a new partner for help: Doorman Dave's nephew Emilio. Meanwhile, a surprise newcomer shows up in Timmy's life and, as if things couldn't get more hectic, Timmy's pants have been stolen by a six-toed cat.